We are glad to inform you about our new edition of Business Guide Turkey. 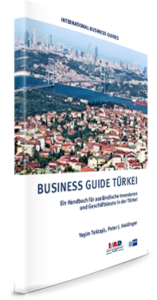 The Business Guide is very useful for decision makers of international companies, who are planning to enter the Turkish market or for those who want to strengthen their market position in Turkey. The guide includes facts about the economic and legal conditions in Turkey, information about Turkey, the Turkish culture and mentality and important details which should be considered in intercultural dialogues. Please note that the Business Guide is only available in German for now. English version will be available soon. Published by: Institut für Aussenwirtschaft, October 2016.